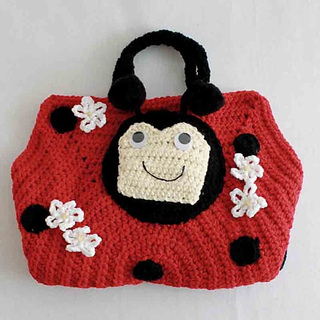 Ladybug Tea Set crochet pattern includes a tea set carrier, small ladybug, tea pot, cup, creamer, sugar bowl, large plate, small plate and cupcake. All set pieces work up quickly with worsted-weight yarn. 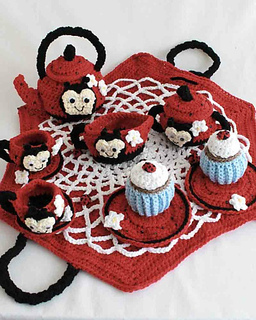 Multiple colors and a variety of crochet stitches set this child crochet tea set at an intermediate level pattern. Make enough pieces for two to dine comfortably on the play mat, or increase the place settings to the number needed for more guests to join in on the fun. Ladybug, Ladybug, let’s take a break. It’s time for tea. Please pass me a cupcake. Size 10 Crochet Thread: Scarlet, Black, and Maize.